National MP Nikki Kaye has lent her voice to the medicinal cannabis debate, saying her experience with breast cancer has changed her views. In an interview with Newshub, Ms Kaye says she’s happy to be back at work having stepped down from her ministerial roles in September last year following her diagnosis. She says her treatment has given her something back – an intense love for her family and a re-think on some health issues, one of which is medicinal cannabis. Access to medicinal cannabis has been in the political spotlight after union stalwart Helen Kelly began campaigning for it following her terminal lung cancer diagnosis. Ms Kelly, who died in October, openly used cannabis oil to treat her pain. 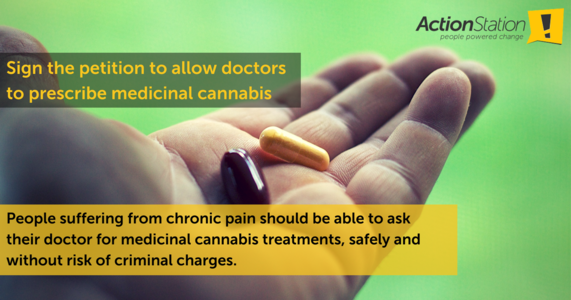 People suffering from chronic pain should be able to ask their doctor for medicinal cannabis treatments safely and without risk of criminal charges. Is there a petition to get rid of Peter Dunne? Because while I still think people should sign this petition it’s a bit of a waste of time while that pontificating and feet-dragging idiot is still there. And while we’re on the subject there is absolutely no justification for someone being hauled before the courts for doing something that is harming neither themselves (and moderate use of cannabis is not harmful) or others. the most damaging aspect of marijuana is it’s status in law. It is really weird that Drs are able top prescribe much more dangerous drug, but not medical cannabis. Far more people die from prescription drugs than all illegal drugs combined. And for every illegal drug chances are you’ll find a legal equivalent e.g. Adderall === methamphetamine, oxycontin == heroin, etc. (although strangely enough there’s no equivalent of THC that I know of). There’s also an anti-depression drug that’s very similar to MDMA (i.e. increases the levels of serotonin in the brain) but that I can’t remember the name of. Point is our drug laws are completely fucked up. Also opiates should only be prescribed for short-term chronic pain. Yet we have Drs prescribing opiate-based pain-killers long term for chronic pain-sufferers when medical marijuana would work just as well without the risks of addiction and other side effects. The whole thing is insane. it is interesting how peoples perception changes when they need something themselves. and what the poster said first comment. I’d sign a petition to get Peter Fuckn Dunne into retirement. That guy is just a useless prick who stays on cause getting money from the tax payer for nothing sure beats putting in a honest days work. I find it extremely frustrating when politicians change their views on something because of “personal experience”. Surely we want them (especially the more senior ones as Nikki Kaye is) to be able to listen, consider and form a view different from their current one? If they can’t put themselves in other people’s shoes without having some sort of personal epiphany then the need to get out of the game. Effing useless. I don’t think i’m being too idealist here am I? – it’s their job to be able to think outside their own lives? They are capable of neither sympathy nor empathy. Part of the job description. Be terrible if they identified with the general population wouldn’t it? I feel the same gonzo. Like, “I used to be a lock-em-up-throw-away-the-key guy, but then my son got in trouble and I realized that’s wrong.” That’s great, but also, f*** you. Who tf needs to become unwell to affirm that people should get the best pain relief they can? Not exactly the champion that NORML has been waiting for. She sounds a bit to me like: yeah personally I think sick people should get it if they need it, but I’m not sure how that’s going to work for my political career with me being in the National party so I’ll throw in ‘if’ and ‘probably look at it’ so I can back away from that position later if I need to. I look forward to Nikki Kaye probably looking into giving sick people their medicine if the political situation allows it. It would be nice (!) if policies and decisions were more evidence-based but politicians are only human, which, in practice, means that they make decisions largely based on personal prejudice, bias, and what’s politically expedient. Under the Misuse of Drugs act it’s a committee that decides how drugs are classified and that committee reports back to the appropriate minister. If you’re interested you can look up who the members of the committee are, backgrounds, minutes from meetings etc. Gives some interesting insights. The EACD is an advisory body that only makes recommendations to the Minister. It is the role of the Minister to decide whether to put forward any recommendations to Parliament for decision. Yes. It’s important to clarify that the committee makes recommendations. It’s then up to the Minister. But I would imagine that the Minister would just rubber stamp what ever the committee says. Personally I think those of us who are advocating drug reform should first aim at and try and influence the EACD. Get them on board as a strategy then things become a lot easier. Afterall, it’d be a lot harder for people like Dunne to keep dragging their feet if it’s known that they are going against the advice of their own expert committees. I think there’s a long history and ample evidence that politicians have ignored expert advice. So, I’m afraid I’ve a more ‘jaundiced’ view of politicians and their decisions. Even Peter Gluckman might share this view although he’d never admit it, at least not in public. In any case, what’s the meaning of Ministerial Responsibility and all that if he/she were to “just rubber stamp what ever the committee says”? It makes no sense to me, frankly. “In any case, what’s the meaning of Ministerial Responsibility and all that if he/she were to “just rubber stamp what ever the committee says”? To me it means the buck stops with the Minister. Same to me and it does not make much sense, therefore, to suggest that a Minister or Parliament for that matter would simply accept any committee’s output and “just rubber stamp” this. It flies directly in the face of having ultimate responsibility. Well it means they have enough faith in the experts to trust whatever they say. “2. In my opinion, the classification of purified CBD as a Class B1 controlled drug, requiring Ministerial approval for use, is incorrect. Instead, as CBD is listed as a prescription medicine in the Medicines Regulations, its use should not need Ministerial approval. The Misuse of Drugs Act (MoDA) only requires one molecule of a controlled substance to be present in a preparation for it to be captured as a controlled drug. Which means anybody manufacturing CBD-based medicinal products risks prosecution if there’s even one molecule of THC present. And any CBD products imported from overseas will have to be tested each time for the presence of even one molecule of THC. I told you our drug laws are insane. Helen Kelly stood and battled for justice and fairness ……. Basic human rights and decency. The decency that is lacking in politicians and wealthy employers ,…. who need people like Helen Kelly to force them into paying fair wages …and provide safer work environments for workers. Will be defeated by the moral rightness of her causes …. The light she casts even in her death …. shines s brighter,…. showing up the wrongs in the world ….. but also the path to a good society. In my dreams I see Helen standing for election this year. Leader of whatever party within months. Prime Minister within 4 years. Maybe should could talk about what the process would be like for someone with the same illness who had to fight MSD for sickness benefit instead of being able to stay on an MP’s salary throughout the process.